Physics homework can be challenging! Get tips to help make the task a little easier. There are now too many unit conversion examples to list in this space. This Unit Conversion Examples page is a more comprehensive list of worked example problems. This equations of motion example problem consists of a sliding block under constant acceleration. It uses the equations of motion to calculate the position and velocity of a given time and the time and position of a given velocity. This example problem uses the equations of motion for constant acceleration to find the position, velocity, and acceleration of a breaking vehicle. This example problem uses the equations of motion for constant acceleration to calculate the time needed for one vehicle to intercept another vehicle moving at constant velocity. Here’s an example applying the equations of motion under constant acceleration to determine the maximum height, velocity and time of flight for a coin flipped into a well. This problem could be modified to solve any object tossed vertically or dropped off a tall building or any height. This type of problem is a common equation of motion homework problem. This example problem shows how to find different variables associated with parabolic projectile motion. Accelerometers are devices to measure or detect acceleration by measuring the changes that occur as a system experiences an acceleration. 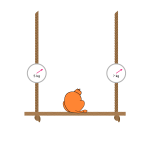 This example problem uses one of the simplest forms of an accelerometer, a weight hanging from a stiff rod or wire. 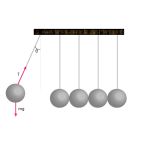 As the system accelerates, the hanging weight is deflected from its rest position. This example derives the relationship between that angle, the acceleration and the acceleration due to gravity. It then calculates the acceleration due to gravity of an unknown planet. Have you ever wondered why you feel slightly heavier in an elevator when it begins to move up? Or why you feel lighter when the elevator begins to move down? This example problem explains how to find your weight in an accelerating elevator and how to find the acceleration of an elevator using your weight on a scale. This example problem shows how to determine the different forces in a system at equilibrium. The system is a block suspended from a rope attached to two other ropes. This example problem highlights the basics of finding the forces acting on a system in mechanical equilibrium. This physics problem and solution shows how to apply Newton’s equation to calculate the gravitational force between the Earth and the Moon. 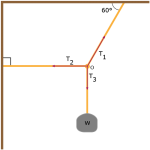 Coupled systems are two or more separate systems connected together. The best way to solve these types of problems is to treat each system separately and then find common variables between them. 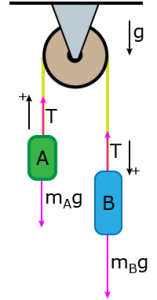 The Atwood Machine is a coupled system of two weights sharing a connecting string over a pulley. 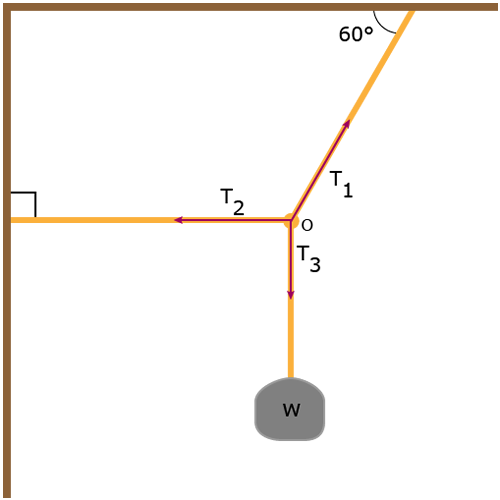 This example problem shows how to find the acceleration of an Atwood system and the tension in the connecting string. This example problem is similar to the Atwood machine except one block is resting on a frictionless surface perpendicular to the other block. This block is hanging over the edge and pulling down on the coupled string. The problem shows how to calculate the acceleration of the blocks and the tension in the connecting string. These example physics problems explain how to calculate the different coefficients of friction. These example problems show how to calculate the momentum of moving masses. Finds the momentum before and after a force acts on a body and determine the impulse of the force. Shows how to find the velocities of two masses after an elastic collision. Shows the math to find the equations expressing the final velocities of two masses in terms of their initial velocities. Two charges separated by one centimeter experiencing a force of repulsion of 90 N.
Electrical charges generate a coulomb force between themselves proportional to the magnitude of the charges and inversely proportional to the distance between them. This example problem shows how to use Coulomb’s Law equation to find the charges necessary to produce a known repulsive force over a set distance. This Coulomb force example shows how to find the number of electrons transferred between two bodies to generate a set amount of force over a short distance. This example shows how to determine the energy of a photon of a known wavelength.